1 Tuner + 1 or more non-Tuner monsters. Once per turn, you can Special Summon 1 Level 4 or lower monster from your hand. You cannot conduct your Battle Phase the turn you activate this effect. Once pe.. There can only be 1 face-up "Earthbound Immortal" monster on the field. If there is no face-up Field Spell Card on the field, destroy this card. 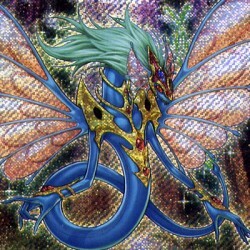 Your opponent cannot select this card as an attack targ..
"Majestic Dragon" + "Stardust Dragon" + 1 non-Tuner monster. You can Tribute this card to negate the activation of an opponents Spell Card, Trap Card, or Effect Monsters effect and destroy all cards y..
Tuner + 1 or more Non-Tuner monster. Once per tur, during your Main Phase, you can select 3 Equip Spell Cards from your Deck, have your opponent pick 1 of them at random, and add it to your hand. Retu..